The Trust protects Ontario’s significant heritage places holistically, not just one building or property at a time, but structures, cultural landscapes, districts, watersheds, and systems. By so doing, we provide for dynamic and resilient communities that are adaptive in the face of change. The Trust’s conservation and stewardship activities are designed to reflect the diversity of place and people, and to demonstrate excellence and best practices in conservation. The Trust’s Integrated Conservation Strategy is designed to protect the complex layering of history and the ways it is represented in our communities, to recognize and support the intersection and interplay of all forms of heritage – cultural and natural, tangible and intangible. The Trust works with governments, Indigenous communities, conservation authorities, land trusts, heritage organizations and private landowners to ensure the stewardship of its lands and easements, providing vital community relationships and vibrant local participation. More than 90 per cent of the Trust’s properties are managed with partners. 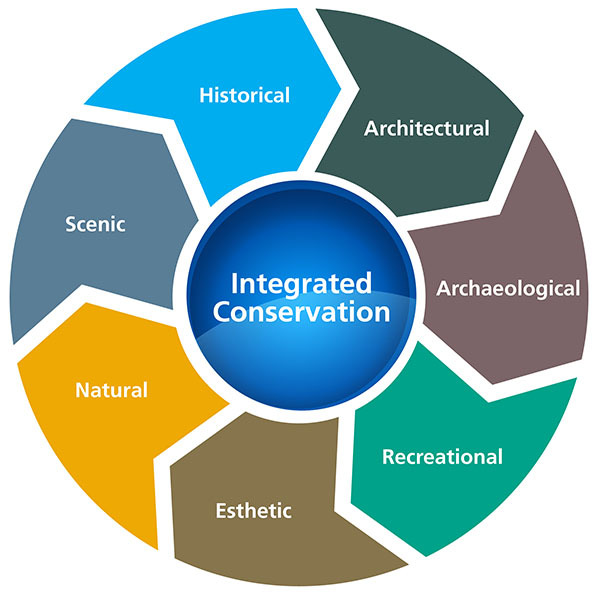 The Trust employs an integrated conservation approach to heritage, as shown below.